In 1983, Peter Laird and Kevin Eastman were working regular jobs when they were introduced and began working for a small local comic book publisher. While sitting around sketching and watching television one night, the pair began joking about the current genre of comic book superhero, with the two most popular themes centering around ninjas and mutants. Envisioning a silly parody, Laird and Eastman came up with a comical storyline of four turtles who were exposed to a radioactive substance which caused them to grow to human size proportions. Taken under the wing of the venerable sage Splinter (a rat who had undergone the same transformation and was trained by a master ninja warrior), the foursome used their unique abilities and training to fight against criminals, while always looking for teenage fun and frivolity. The first issue of the comic book did so well, it was reprinted three times selling a total of 53,000 copies. 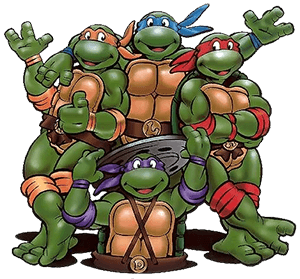 While this was a huge success for the authors, it was a small foreshadowing for what was soon to come.The turtles (Michaelangelo, Leonardo, Raphael and Donatello) would soon find themselves on the cover of magazines, lunchboxes, school folders and represented in television cartoons, action figures and movies. By 1990, the cartoon appeared each day on more than 125 television stations, the movies were hits at the box office, and the comic book was selling at a rate of 125,000 each month, making it the most successful black and white comic book in history. While the turtles have not quite disappeared, they suffered from over-saturation and from the usual coming of other fads to take their place.